Feast your eyes on one of a scant 50 Ford Galaxie Lightweight examples produced for 1964, which is set to be auctioned off at Mecum’s Kissimmee event from January 6th through the 15th. Developed in order to provide a base for big-body NHRA Stock and Super Stock drag racers, the 1964 Ford Galaxie Lightweight was propelled by a 427-cubic-inch V8 with twin 4-barrel Holley carbs, conservatively rated at 425 peak horsepower with 480 lb-ft of torque. Half of all units produced left the factory with a 3-speed automatic transmission, while half came equipped with a 4-speed Toploader manual. This example has the latter transmission, paired to a 31-spline, 4.57:1 rear end. 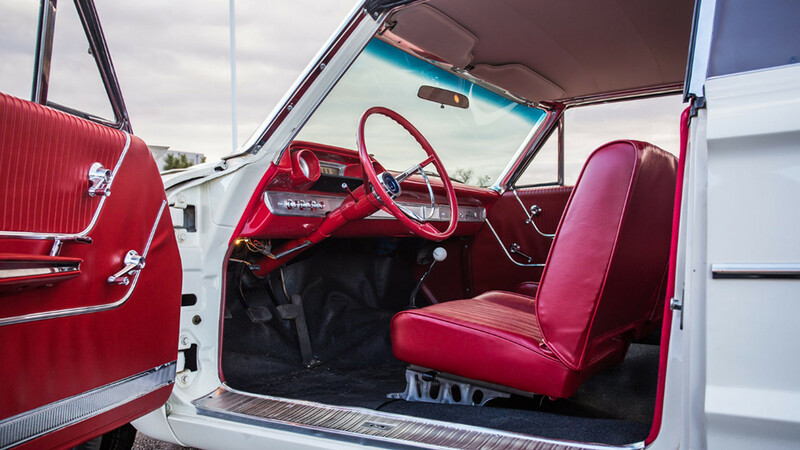 What makes this limited-run Galaxie “lightweight” is a combination of a lightened frame, and the deletion of a range of equipment and materials like sound-deadening, carpeting, arm rests, body sealers, the heater, spare tire, and courtesy lights. The 1964 Ford Galaxie Lightweight was available only in Wimbledon White with a red interior. This example retains that scheme, which looks as radiant as ever thanks to a comprehensive restoration. Mecum forecasts that the super-rare two-door will fetch between $150,000 and $175,000 when it crosses the block on January 14th, although if you’ll pardon the cliché, we rather think it looks like a million bucks. For more photos and info, check out this 1964 Ford Galaxie Lightweight’s listing on the Mecum Auctions website.